With that warning, H.M.S. Richards, the “preacher’s preacher,” continued to deliver a great series of lectures to preachers and seminarians in 1957 that, in published form, soon became a classic. 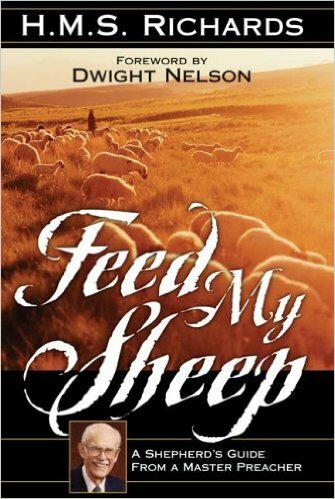 Brimming with anecdotal gems from his vast expertise in evangelism and gleaned from his wide reading, Feed My Sheep has developed into a treasured manual on preaching for a few generations of pastors. The counsel seems strikingly contemporary (“The smaller the pulpit, the better”; “Vital preaching is actually always conversational”; “Preach without notes”), even though the stories seem timeless. Most coming from all, Pastor Richards argues that this only preaching that changes lives is always that which centers upon the incomparable Christ, “He on the pierced hands.” Few books offer more information-and inspiration-per paragraph; few will light this kind of lively fire inside the soul. This entry was posted in Religion & Spirituality and tagged Feed My Sheep.